Huawei is launching the P20 series next week, and according to info from China, it is also preparing to launch the first smartphone with 512 GB of storage. It's unclear if this will be a version of one of the P20 phones, or a different device altogether. Listed on TENAA, а phone with model number NEO-AL00 was edited to say “6GB RAM + 512 GB ROM” in the Memory section on the last row. The fact that the change was specifically requested after the initial certification request makes it certain that it's no typo. Although Huawei has enterprise-level data storage solutions, it still lacks mobile storage production plants, nor has an in-house technology to build 512 GB memory chips. 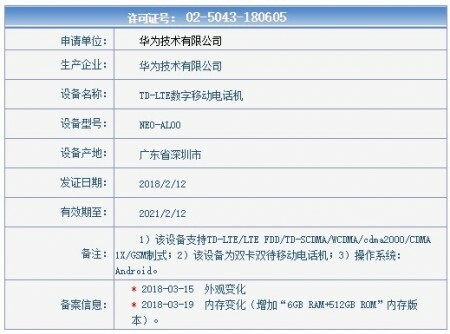 This means the NEO-AL00 phone will either have Samsung’s storage solution or Huawei is in the last steps of developing the tech and might introduce it really soon. Currently, there are two Huawei phones that employ 256 GB storage - the Mate 9 Porsche Design and the Mate 10 Porsche Design, so maybe another Porsche edition will be the first to reach the 512 GB mark. I keep all my music on my micro SD cards, have a small hard cover case. Bought a Samsung 64gb from Amazon and they sent me ten, but i paid only for one lol.